So, how does it fair? Let’s take a look. I was provided with the boxed version of the library which meant no long download times. (A bonus when your internet speed is as bad as mine). First you install the Engine 2 sampler which came on a separate disk. Then it was just a matter of copying the library from the two DVDs provided to your hard disk. Activation is handled by a serial key with a call and response activation. I’m sure many of you would appreciate the Engine 2 sample player but others would bemoan the need to install yet another sampler when they most likely already have a copy of Kontakt. The interface is pleasant and functions well but it’s not without it’s problems. Personally I found it too heavily stylized and not thoughtfully laid out. For instance, the controls could be more strategically placed. Having the universal volume, EQ, reverb and pan controls split across the bottom is an odd choice. The same can be said about the instrument controls being placed is an uneven diagonal around the central dragon motif. Also, I found the fonts difficult to read, as the cursive too severe. The interface is the first thing we’re presented with, and it dictates how we interact with the samples. The difference is night and day when you compare the interface of ERA to Cinematic Strings 2 which we reviewed recently. But enough about how it looks, what you’re really here for is how it sounds and how easy is it to use. Tarilonte has dealt the the limitations of the instruments really well. Some of the instruments do have “oddities” in the samples. For example you’ll hear the mechanical sounds of the keys but it’s hard to criticize this point due to the realities of working with historical instruments. With many of the wind instrument, they are naturally louder the higher in pitch they play. The library uses “Dynamic Curve Correction” to tame this, but it can be turned off if desired. Personally I was amazed at how great the renaissance recorders sound and how smooth they are to play. If you’ve ever worked with a modern recorder player you know tunning is a massive issue to deal with. I can’t imagine the amount of work needed to tame their historical counterparts. Let’s take a quick look at each section of instrument we’re provided with. There are three keyboard instruments provided: a organetto (a portable pipe instrument), a spinet (a small type of harpsichord) and a virginal (another type of harpsichord). The makers have opted to cover the lesser sampled historical instruments rather than retread old ground with recording pipe organs and full harpsichords both of which have been covered convincing enough already. The keyboard instruments have a volume control for the mechanism sounds. Useful if you want to add some intimacy and authenticity to your track. The plucked string instruments such as the Baroque guitar include some thoughtful additions of slow/quick plucked chords and well as looped chords. It’s an amazingly beautiful instrument to play with buckets loads of depth. The Renaissance Lute also deserves an honorable mention as it’s legato sampled and has built in controls for the fret noises and slides. We’re also provided with an early renaissance harp, a bray harp, a Zither and a Psaltery, all of which sound great. Now moving onto the bowed instrument in the library, unfortunately we’re only provided with three: a Bass Viola da Gamba, a Fidule and a Hurdy Gurdy. It would have been nice to have a full consort of Viols, this would cover the entire range a bit better than just the Bass Viola and Fidule. But, the instruments that are provided sound fantastic and are very playable. The Fidule provides a tone and character that you just can’t get anywhere else. The wind instruments are probably my favorite. The library packs 20 wind and reed instruments from a consort of Renaissance recorders and Crumhorns to a wooden flute and a Shofar. The renaissance recorders for me were a real treat to work with. The legato samples work well and are convincing and they’re a real pleasure to play. Having the full consort is great to play around with some traditional 4 part harmony. One of the fantastic features of the winds is a whole range of articulations is provided from staccatos to trills and other ornaments. This means that creating realistic and more dynamic melodies is possible with ease by utilizing the patch keyswitches. Something that I’ll cover more in-depth in the next section. Two war horns are provided with two patches, one for the sustained, playable instrument and one for the instrument calls. The “calls” patch is used by choosing a keyswitch to select the call and then play the tone you want. There’s over 20 different calls for each instrument available in over 2 octaves, so here’s plenty to play with. The yellow highlighted keys are the keyswitches and the light white keys show the available pitches. The library features 15 different percussion instruments, each with 4 round robin and sampled up to 10 velocities. With frame drums, hand drums, snare and tambourines, there’s plenty to play with. I particularly liked the snare collection as it offered an authentic, aged sound that’s difficult to find elsewhere. They are also well thought out with rolls, flams and hits being sampled and a cross fade volume controller has been provided for the rolls (perfect for an execution). There’s also a few church bell samples provided which are great for adding atmosphere. Each instrument has one patch and a collection of keyswitches to control various aspects of the performance. The Renaissance recorders for example have a Legato, Staccato, Moderdent and Short Trill keyswitch. The legato keyswitch is split by having the instrument play portato in the lower velocities and legato in the higher. Integrating all the articulations each instrument offers into one patch rather than separating them into patches makes the compositional workflow much cleaner. The fact that everything is accessible from one patch means that creating performances that utilize multiple articulations becomes much easier and is achievable using a single track. The fact that everything is accessible from one patch means that creating performances that utilize multiple articulations becomes much easier and is achievable using a single track. There is one exception which is the baroque guitar, It wouldn’t be possible to use the chords and a legato line at the same time on one patch. This is where you would need to load up two instances of the instrument and use chords in one and the melody in the other. Continuing my example of the controllers provided for the Renaissance recorders, we’re given control over the Expression (volume), Vibrato Volume and Vibrato Speed. Each can be configured to your midi controller for live control. The library also comes with over 100 soundscapes which are well constructed and provide a useful palette of sounds to draw inspiration from. Each soundscape has up to 6 layers which can be volume controlled to bring them in and out and create a more evolving, organic sound. They cover a range of fantasy orientated moods from “Dreams of Fantasy” to “Ice Queen”. There’s also a range of wonderful sound design elements like scrapes and whooshes. 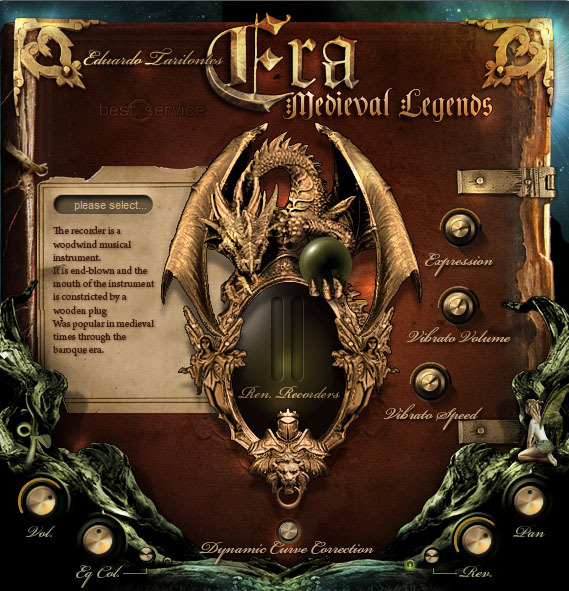 Era Medieval Legends provides a great collection of realistic, authentic and most importantly, usable instruments. If you’re a composer looking to add some new color into your historical or fantasy music, this library is a must buy. 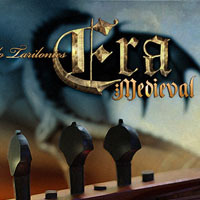 You can try Era Medieval Legends for yourself using Try Sound. A full range of renaissance instruments would be wonderful. A cornetto and sackbut and dulcian and missing members of an english consort (cittern and bandora). An orpharion and theorbo would be usefu forb continuo as well as the bright sound of a full renaissance flute consort. Also, tuning options – can the package produce just tuning and quarter comma mean tone? There are so many sound colours to add. I actually tried to learn to play Cornetto in college. Didn’t work out to well though. After reading this very good review (there are a few typos, btw) and hearing more samples from the website, I will purchase Era. Adding to the review, the bagpipe(s) seem to be astoundingly accurate, something that is impossible to find as samples elsewhere. please. Maybe they will someday provide an interface update. cal tools in a horrible wrapping. Better than the other way round, though. Being a recorder player myself, I’d have to say that the recorders sound surprisingly realistic – more so than any other sample instrument I’ve heard, though I can tell at the first change between two tones that they’re samples, the alto and soprano in particular would be easy to pick out from a line-up. I’d still not hesitate to use the tenor or bass recorders, though, and the alto and soprano might still add lushness by doubling actual recordings. All in all, and from the samples I have heard, this sounds like a library I will seriously consider buying, as it would work really well with the style of music I seem to working with these days.